I hope everyone is/has enjoyed their Christmas/New Year/Holiday break. As we all start to see the ‘Back to School’ sales (sorry Juniors – however the time is close), our attention turns to cricket starting next week. Some of our older Juniors have already started training – and we have also had a number of Nunawading Junior Cricketers playing representative cricket in December/January – which is fantastic. At Nunawading, we are very fortunate to have two ‘Level Three’ accredited coaches (Level Three, can only be obtained via nomination/invitation from Cricket Australia). Our coaches – namely Club Coach Rob Ferdinands and also Leigh Callander – both work with the seniors, and have had great success working with some of our Juniors as well. On Friday 1 February (6.00pm – 8.00pm), Rob and Leigh will be holding a two hour coaching course (Coach the Coaches) for Nunawading Coaches/parents. This will be a great opportunity to hear from Rob and Leigh, who will not only talk about coaching styles and methods, they will also introduce some drills which you can use. At Nunawading (like all clubs) – our success is built on parents helping out, and this includes coaching teams. If you are interested in understanding coaching a bit more – then this is a great opportunity. Please let me know if you are interested, as we are keen to have a good number of Mums and Dads attend. As always, Nunawading is always looking to promote Community Involvement, and work with other Community Groups. 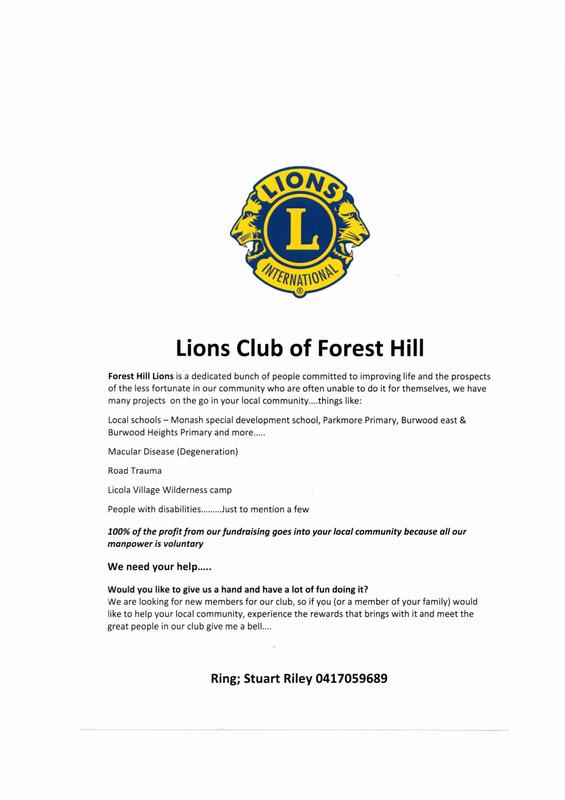 The Lions Club of Forest Hill – who do amazing work – are in need of some new Members, so that this work can be continued. I am sure we have all heard of the Lions Club – however if you are interested to learn a little bit more about what they do, and what is involved, please refer to the attached brochure. There is no harm in making a phone call – one which may just ensure the work of Forest Hill branch continues. If I have left anyone off, please let me know, so we can celebrate this achievement (Clubs do not get notified directly of players who are selected). It also gives me great pleasure to announce that the U18 BHRDCA team (which included Joshua, Rohan and Cameron) and the U14 Team (which included Kaelan) both won their tournaments. Congratulations to all on this great achievement. I will have more details and photos on this in the coming weeks. As also mentioned in December, we have two opportunities for our cricketers to ‘play on the MCG’. On the Second day of the Boxing Day Test Match, a number of our Junior Blasters played at lunch time. This Sunday, our two Junior Premiership Teams from last season (U12 and Girls Stage 2 team), will be ‘Walking with the Stars’ prior to the Melbourne Stars v Brisbane Heat game. If you are at the ground, please keep an eye out for them and their Premiership pennants. Thanks to Jean-Paul Lefebure for organising. · Wednesday 30 January – Commencement of the Girls competition. · Friday 1 February – Resumption of matches (U12, U14, U16, U18) and Junior Blasters. · Saturday 2 and Sunday 3 February – Super 7s and Fast 9s will resume. Coaches/Team Managers will advise all players directly when training resumes. I still have a number of Membership packs, which I will distribute to coaches in the coming weeks. Additionally, for those who took up my offer of some free tix to the BBL, as mentioned, I only had a few, and they were quickly exhausted.